Having just lost this evenings complete posting thanks to Scottish Power losing the power supply in our neighbourhood (is this the start of the end to fossil fuel supplies? ), I’m busy re-typing. There’s an auld Scottish saying: ”better to say ‘here it is’ than ‘there it was’”. Well, this image features wooly Woody the deerhound, who formerly co-habited wth the humans of my household. That is, before I came along. Sadly, he is no longer with us. Equally as sad, the meadow, for as far as the eye can see in this image, is earmarked for a massive housing expansion. Open countryside, formerly part of the Dundas Estate, to be wiped out to provide for the benefit of the economy. As a hound of the chase - I ask you - what madness drives these human kind to a life, where they must have several homes each, multiple empty office space, tarmac and concrete infrastructures and vacant industrial units in exchange for a ‘there it was’ dewy eyed reminisce. Fortunately we deerhounds are above all this - but alas, we are finding ourselves suffering on behalf of that human nonsense ‘the economy’ the enemy to peace, nature and happiness in the eyes of an ancient inhabitant of Scotland. And with the forthcomming human Political elections in Scotland on May the 3rd . . . Here’s Rogues rant to all politicians - Let’s try and have a world where, when it comes to nature and existence, we can say - ‘here it is’. We have brought you suggestion for the prize of a ‘guid’ days work by the Scottish deerhound in previous posts and today we’ve got a wee something for the weekend. When you’ve roasted that fine venison and served it to the plate - what sauce? From Meg Dods’s Recipes comes ’Venison Sauces’. Venison may have a sweet, sharp or a savoury sauce. Sharp sauce. – A quarter-pound of the best loaf-sugar, or white-candy sugar, disolved in a half-pint of Champagne vinegar, and carefully skimmed. Sweet sauce. – Melt some white or red currant jelly with a glass of white or red wine, which ever suits best in colour; or serve jelly unmelted in a small sweetmeat-glass. This sauce answers well for hare, fawn, or kid, and for roast mutton to many tastes. Gravy for venison. – Make a pint of gravy of trimmings of venison or shanks of mutton thus: boil the meat on a quick fire until it is browned, then stew it slowly. Skim, strain, and serve the gravy it yields, adding salt and a teaspoonful of walnut pickle. And there you have it, more delightful old-time food recipes from the Scots Kitchen for deerhound owners to up and tackle. If we are to bring home the game, it’s up to our humans to ‘hot the pot’. 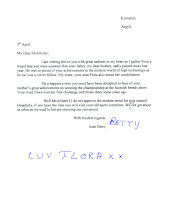 One week ago I received this communicae from Aunt Betty and Aunt Flora from Argyll containing some mixed news. It’s not often deerhounds get the opportunity to sit at the typewritter and send letters to the family, this I do know. All to often we hounds are otherwise engaged in sleeping, eating, walking or the chasing pursuits. It was wonderful to receive the letter, the sad news aside, and I really must find more time to visit my kin around the country. Also included in the package were two rather marvelous paintings featuring members of the family. Much to my annoyance tho’, the foolish ‘posty’ bent the envelope and in doing so scored the paintings whilst forcing them through the letterbox. Thankfully, after pressing them between two rather heavy books, we have managed to remove most of the creasing. Click on the images for a closer view. In family picture 1 we have from left to right: Grandma Agatha with Gt. Gt. Grandma Alice standing behind, Aunt Betty walking and in the foreground Uncle Higgins carrying the bag alongside Gt Grandma Mory. In family picture 2, again from left to right: Grandma Agatha in the foreground with Aunt Flora standing behind, Gt. Gt. Gt. Grandma Berta taking her bath for show day and dear Aunt Betty who posted these portraits standing to her left. And finally, like correspondence from all good Aunts - I could only expect a ‘ticking off’ for my Highland ‘Rogue’ moniker. Still, I hope it’s what makes the rogue so lovable. Anyone wishing to purchase quality prints of the above paintings (as Aunt Betty still has limited copies in her kennel) leave a comment and I can forward the details to my deerhound family in Argyll who may then contact you by return. A good deed is a deed worthwhile. And with this in mind, I thought it would be good to point visitors in the direction of a little charity project hosted by the dog friendly whitespace. 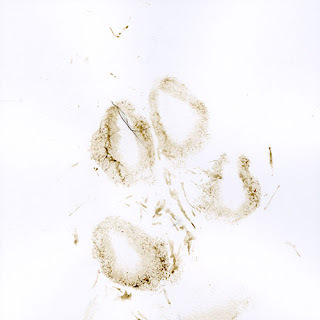 I myself have contributed my ‘Paws for thought’ masterpiece as featured above which you will find on the 10x10 gallery along with many others. If you wish to contribute your own little work of art and in doing so, contribute to a good cause, simply visit the website and find out about the project here. Now get ready, download the submission form here and Vincent van Gogh!. Who knows? You may find your work appearing on the 10x10 online gallery as I did. Go on! - it’s hounds for charidee! 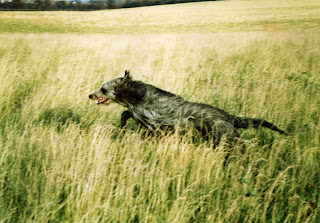 For anyone interested in the Deerhound breed, Rogue would like to invite you to his YOUTUBE Deerhound Group where you can comment, communicate, upload video and just generally discuss deerhounds when really, you should be out hunting with them. Just click here to come and join the Tin´chel. Simply click the ‘Join This Group’ button and Rogue will welcome you in with all that usual large hound affection. From the Scottish Breeds Show at Ingliston, Royal Highland Centre on Sturday 31st of March this year. All the fun, tension and excitement, from in and around the show arena. And although I, Rogue wasn’t showing, my mum as mentioned two posts past was CC’d and awarded a Best of Show select - but hey! Every Deerhound is a winner as all who live with us know. Once you’ve boiled that pot of game soup prepared from ingredients from the successful hunt, mixed with a few garden vegetables fresh from your patch, what could we serve a snack ladel full in? 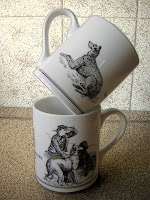 Simple answer, the Deerhound club UK mug. Fine for teas, coffees and soups and a neat little talking point for guests in any deerhound household. Contact the deerhound club at the usual places or ask at the deerhound show ring at most large dog shows. And tell them Rogue sent you. Here we are, one complete year on from the first ‘Rogue’ Scottish Breeds hound show video. This year we party in the name of Rogues mum to celebrate her winning the Best of Show at the 2007 show in the Royal Highland Centre, Ingliston on Saturday the 31st of March. 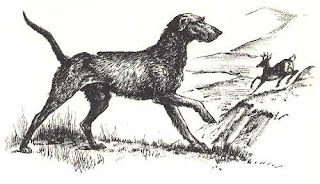 As per usual, if you wish to view detailed show results, visit the Deerhound Club’s website and should you wish to watch a little video clip of how ‘Greystiel Tanar by Brylach’, my mum, come to win the BoS, just press play on the video below. If you enjoyed the show video it’s best to mention that I have so much footage of the Deerhounds at Scottish Breeds Show (over an hours worth) to sift through, that I hope to manage to post an edited highlights of the event sometime during the next couple of days. So don’t forget to return. In the meantime - stay alert - and good hunting.